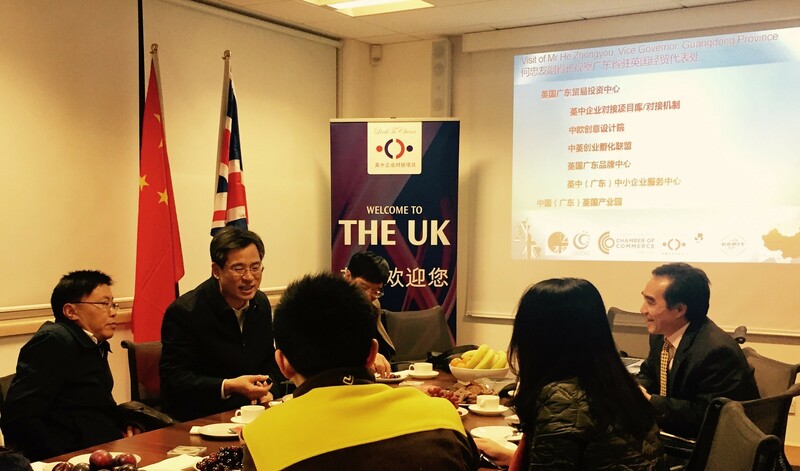 A largest trade delegation consist of more than 200 businesses from the Chinese economic powerhouse Guangdong Province visited London today and staged a seminar that is attended by hundreds of British companies. 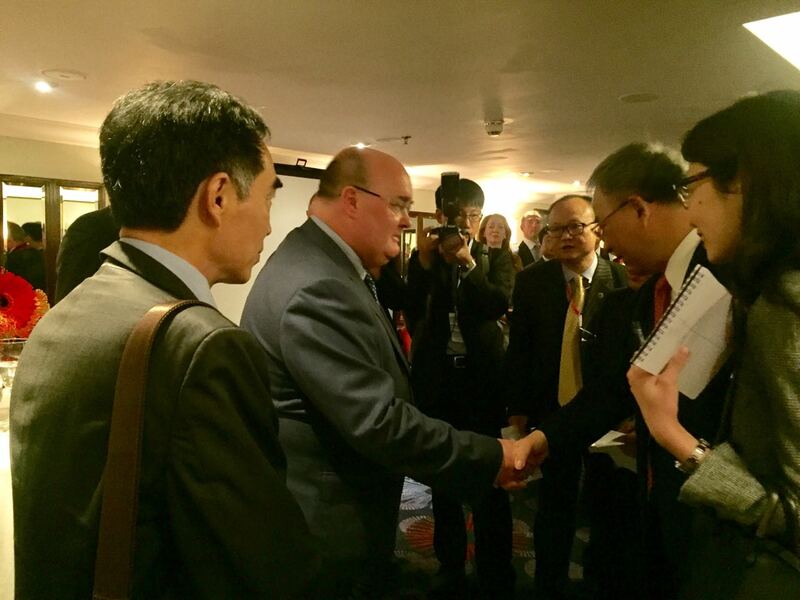 The delegation is led by the Leader of Guangdong Mr Chunhua Hu who is seen here (left picture) shaking hand with Andrew Dumpsty, Chairman of The Enterprise Forum and asking him “Are you a fan of Guangdong” when he spots an badge of the Guangdong Britain Business Chamber that Mr Dumpsty is wearing. 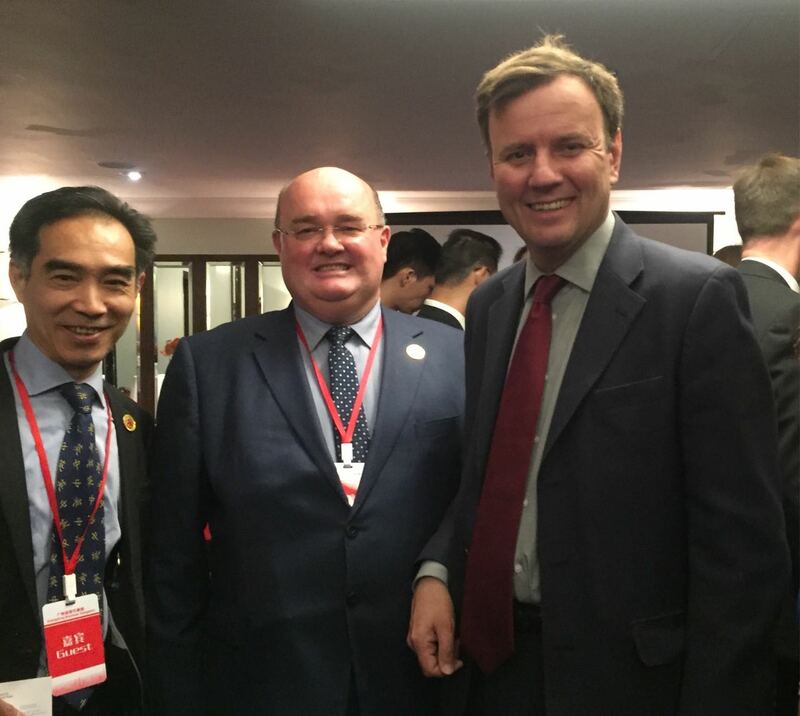 Mr. Greg Hands, MP and just appointed Minister of State for International Trade hours earlier, is seen here with Dr Wu and Mr Dumpsty before he delivers the welcome speech to the 700 audience at Guangdong business seminar. 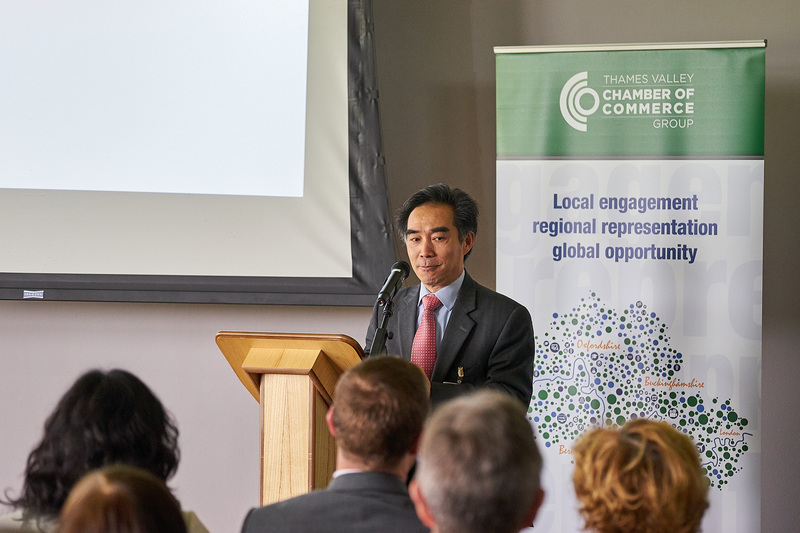 Thames Valley Chamber of Commerce today launches a brand new initiative to support more of its members in the Thames Valley for global markets. Further to an agreement signed last week between BCC LinkToChina and The Chamber. Dr. Kegang Wu, who is Executive Director of BCC LinkToChina, will work with the Chamber to advise the chamber and its members as the China Market Specialist. 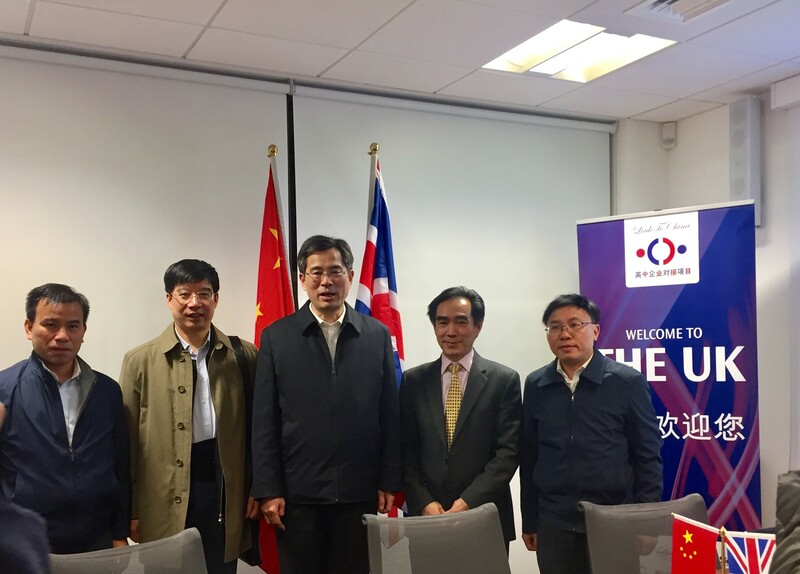 A senior government delegation, led by the Vice-governor of Guangdong Province, Mr. Zhongyou He, visited BCC LinkToChina and China Guangdong Economic and Trade Office in the UK today and discussed with Dr Kegang Wu the work of Guangdong British trade and investment. The City of Shenzhen, Guangdong Province is rapidly developing as a hub of financial services since its Nanshan District has become a part of China (Guangdong) Free Trade Areas to pilot more open-door policies and further reform. Thousands of new companies have registered and Nanshan is poised to build an international finance service centre with the increasing demands from Guangdong, Hong Kong and the wider Pearl River Delta regions as well as the whole of South China. The details of the 10th International Finane Expo can be found in the link below. 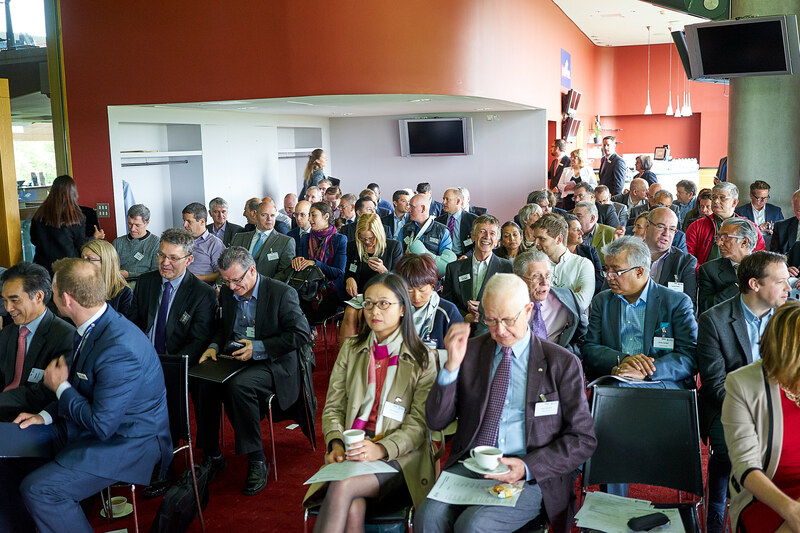 BCC LinkToChina is organising a trade mission to Guangdong in November and mission members will have the opportunities to visit the Expo on 7th November. The trade mission details are available below. This mission, with its full support services, is for both beginners and seasonal visitors to China. BCC LinkToChina has teamed with the Guangdong Province to offer the much needed support and is organising a trade mission to visit Guangdong from 05 – 13 November 2016. IMF has recently upgraded its estimate for China’s growth in 2016 from 6.3% to 6.5% (source: IMF) despite it has lowered its global growth projection from 3.4% to 3.2%. The world’s second largest economy expanded by 6.9% in 2015. Although this was as fast as it has been in the last 25 years, China’s growth is still higher than the US and the euro zone. It is quite easy to get bogged down in the short-term volatility of the stock markets as it affects global economic confidence. However, one must not overlook the bigger picture that the Chinese economic fundamentals are sound. One strong indicator is China’s outbound investments which have grown steadily over the last decade. China’s overseas direct investment in 2015 in the UK increased three times in deal values in comparison with 2014 and 40% across the EU, according to Grant Thornton.